Home Fashion Mini Mathur Repeats This Cotton Saree Style in Loop! 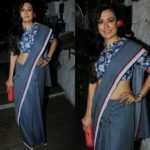 Mini Mathur Repeats This Cotton Saree Style in Loop! There are quite a few celebrities who prefects on how to dress up in season friendly ways. Mind you, not all celebrities and fashion icons are willing to let go off their finest clothing from esteemed couturiers, and stick to basic wardrobe staple to sail through the day. Of course nothing wrong in immersing yourself in a heavy outfit if you can really carry it off, however, the blazing horrid climate in our cities wants us to seek looks and fashion hacks that is pleasing to wear, rather than pleasing to look good, this summer. When Mini Mathur sported a saree style that was exactly in sync with our needs, we can’t help but share it with you. Scroll down and take a look on how Ms. Mini donned this look for a movie watch. 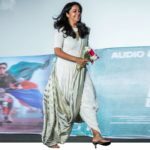 If you have noticed Mini’s dressing lately, you would have noticed, she has flair to pick up easy-going sarees, and give her own spin to wear it as fashionably as she could. While doing so, she sticks to basic rules. Wear a classy handloom saree with printed cotton blouse and give a boost with a notable purse or clutch. This basic formula did the trick last time, and now too. 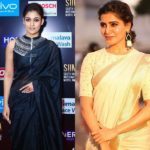 She was spotted at the screening of the movie ‘Tubelight’ where she has repeated the same saree style which she already sported during the launch of Mayyur Girotra’s pet line White Elephant. Last time it was a red clutch box to seal the look and this time it was a gorgeous potli by her end to round off the look. So ladies, take a good look on how she styles her sarees that is so apt for summer and take the needed notes. It will help a lot in coming days. PS – We love her silver earrings too. Do you like the actress saree style? What is your default way to wear a cotton saree? Give us a shout out in the comments box below. We are So Jealous of Kajal Aggarwal’s Latest Saree Style! How Would You Make Your Denim Blue Saree Interesting? 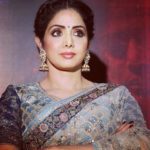 Previous articleThis Net Saree Look Of Sridevi is Totally Adorable!